Instead of a tip this week, we’re sharing an article written by Mark Swartz for Early Learning Nation about what drives our work at the Mount Sinai Parenting Center. Continue reading to learn more about how we are transforming the way pediatric healthcare is delivered, particularly through our newly launched online curriculum for pediatric residents. Originally published on March 27, 2019 on earlylearningnation.com. With 7,400 physicians on staff, New York City’s Mount Sinai Hospital is one of the nation’s oldest and largest teaching hospitals. More than 16,000 babies are delivered in this hospital system every year. The pediatric hospital provides everything from primary care to liver transplants. 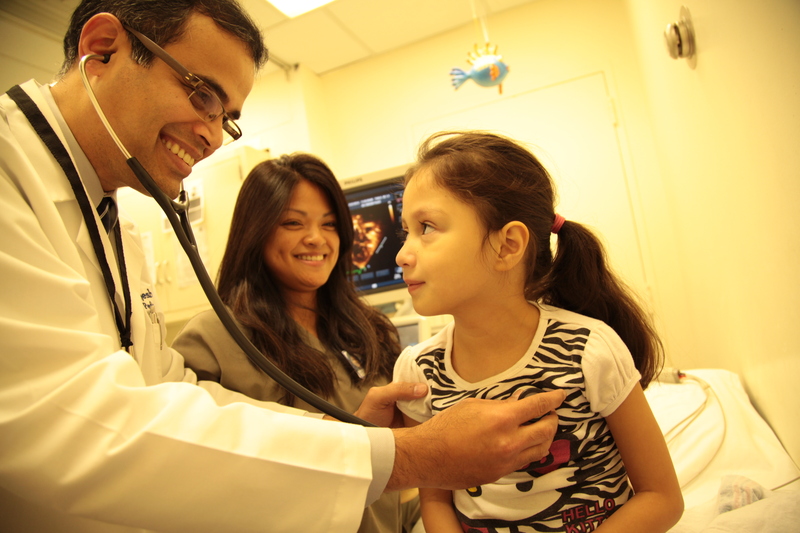 Mount Sinai’s pediatric residency program takes on 22 new doctors per year. Recently, this highly regarded program has undertaken a revolutionary new approach to training, which may be destined to transform pediatric education all over the country. This week, Keystones of Development is taking the next step on its journey to scale, with a workshop at the annual gathering of the Association of Pediatric Program Directors in New Orleans. The goal is to get this curriculum into every pediatric residency program in the country. To understand this breakthrough, think about how preventive medicine—for example, immunizations and antibiotics—has changed medicine in recent decades. Children are surviving diseases that were once considered death sentences. At the same time, pediatricians are seeing an increase in behavioral and developmental issues and are fielding questions from parents regarding tantrums and timeouts. Noticing these trends, Dr. Blair Hammond, 2010 winner of the Mount Sinai Excellence in Teaching Award, found herself frequently seeking the advice of her friend, Dr. Aliza Pressman, a developmental psychologist. The Division Chief of Developmental Pediatrics at Mount Sinai, Dr. Eyal Shemesh, was enthusiastic about inviting Dr. Pressman to teach about the everyday questions that parents have regarding their children’s behavior and emotional development, with a focus on promoting optimal development. Eventually, this partnership gave rise to the Mount Sinai Parenting Center, with Dr. Carrie Quinn coming on as executive director. Another member of the interdisciplinary team was social worker Mariel Benjamin, from the department of maternal child health. The Mount Sinai Parenting Center’s first big undertaking: the reinvention of how pediatric residents are trained. All pediatricians must complete at least a three-year residency. They learn about how to care for premature babies, how to diagnose meningitis and which vaccine to give. They study the treatment for pneumonia and the signs of autism. Historically, however, they’ve been missing one huge piece of the puzzle—the developing mind. “We have people who are new to being doctors,” Dr. Hammond says, “meeting with people who are new to being parents.” On both sides, there’s a feeling of inadequacy, and in between them is the child—who’s new at being a person. Although the text was considered too deep a dive for Sinai’s residents, the center continues to use it for social workers, child life specialists and other professionals. For pediatric residents, finding time for educational initiatives can be difficult. Eighty-hour weeks and the stress of being thrust into new situations contribute to fatigue and anxiety. “It’s about fitting teachable moments into care. Everyday health care moments become opportunities to impart broader parenting skills.” —Aliza Pressman, Ph.D.
One thing became clear: residents wanted not only foundational knowledge but also tips on what to say in the exam room with patients and families. How could new doctors learn to fit this script into their brief 15-minute well visits with children? That was the challenge. “It’s about fitting teachable moments into care,” says Dr. Pressman. “Everyday health care moments become opportunities to impart broader parenting skills.” Take a routine vaccination, for example. The program reminds residents to notice how parents comfort their children and how powerful that connection can be in helping their child get through a difficult challenge. Another tip for the new doctors is giving young patients the option: Do you want me to examine your ears first, or your eyes? And then turning to the parent and observing that being able to make choices increases a child’s sense of agency. Knowing the audience is a key to the curriculum’s philosophy. According to the American Board of Pediatrics, 70 percent of pediatric residents are women. Dr. Hammond notes that 60 percent are graduates of U.S. medical schools, with the remainder coming from foreign medical schools and from institutions like St. George’s University School of Medicine on the Caribbean island of Grenada, which specializes in training American students. They are mostly in their mid- to late- twenties, and most don’t have children of their own. Keystones of Development is free, quick and even accessible on a smartphone—in other words, it’s made for millennials. Each of the twelve modules focuses on a small number of concrete skills for building vital parent-child connections. For Dr. Pressman, Sinai’s program embodies the principle that every health care encounter is an opportunity to foster supporting parents and families. She notes that 99 percent of children are born in a hospital. “That’s an opportunity,” she maintains, “to meet parents where they are and provide them with tools and support from the beginning.” These opportunities continue throughout the first five years, with an average of 15 well-child visits and numerous sick visits. In many instances, the pediatrician is a parent’s only trustworthy source of information and encouragement. The Mount Sinai Parenting Center is making sure these doctors are equipped to model and support behavior that promotes development. Something as simple as how parents speak to their infants can make significant differences in the their language development. “It takes 30 seconds, and it truly matters,” Dr. Pressman says. The Keystones of Development curriculum is free to all training programs. To find out more, contact (212) 241-2772 or sarah.whitney@mssm.edu.